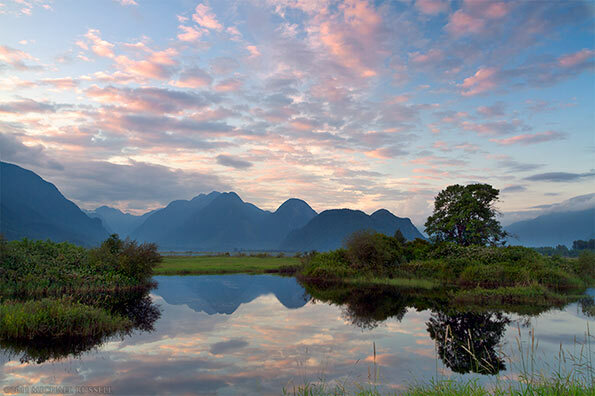 Widgeon Peak is reflected in a pond at the Pitt Marsh Wildlife Management Area on the shore of the Pitt River in Pitt Meadows, British Columbia. A few weeks ago I shared another photograph from this location – the Pitt Addington Marsh near the Pitt River. I made this photograph and a few others of the great reflection in the pond in front of me. When the great light showed up in the sky later on, I tried to get back to this spot to make some more photographs of the reflection with the better light but it was not to be. I am hoping to get back to this location when it snows. Fresh snow on the mountains and the ground with a reflection would be pretty cool I think. 2017 edit: We had a ton of snow this last winter (by our standards) but this meant that there was too much for me to drive to this location. I’m still waiting for an opportunity for the snow photo in this location!